The bio of Edwin Issac Medland | Launceston Then! Edwin was born in October 1879 to Edwin and Grace Medland at Boscastle. His father was a mason and the family moved to live at Chapple, Launceston before 1890. On leaving school, Edwin served an apprenticeship with Mr. William Prockter of Southgate Street. At that time Edwin was a playing member of Launceston Football Club; in fact he was interested in sport in general and in his early years was an accomplished tennis player and in his later years was a keen member of Dunheved Bowling Club. 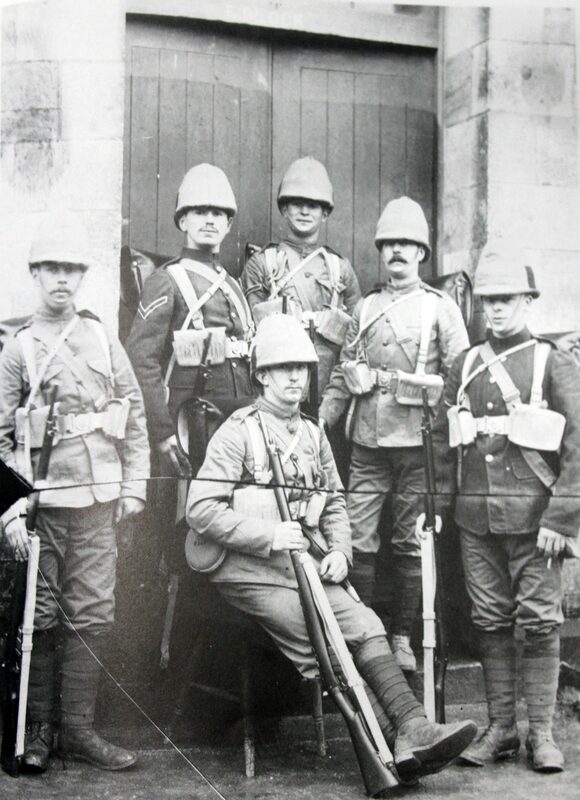 In 1900 at the age of 20 he volunteered to go to South Africa to take part in the Boer War (3rd from the right below). He was one of the seven who went from the town. Remaining there until the close of hostilities in 1902, he then became employed by the South African State Railways. He became a playing member of the Waterval Boven football team, and used to frequently take part in tennis at Pretoria. 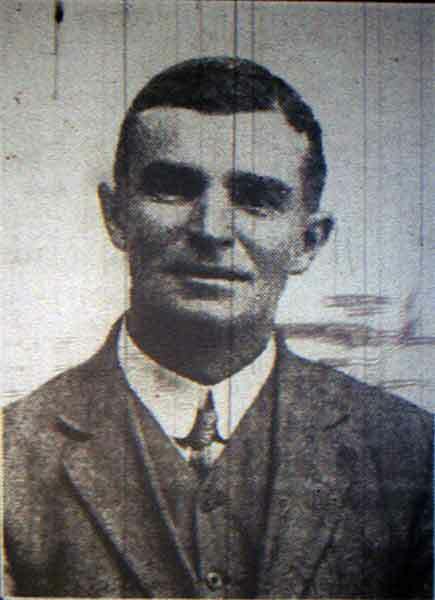 He remained in South Africa during the First World War, a war that saw his two brothers Charles and Richard both killed. He returned to England in October 1919 aboard the ‘Balmoral Castle’ to continue the business founded by his father, first of all residing at Cleaverfield, and then later moving to Carboth in Western Road. He first offered himself as a candidate for the Town Council in 1932, when he and Councillor Gregg were elected to fill the vacancies caused by Councillors H. Hoskin and H. Kittow becoming Aldermen. In 1933 he stood again and was elected second on the poll a feat he repeated again in 1936. At the time of that election triumph Edwin said “that the his work on the Council might not have been spectacular, but he had tried to do his best for the Town.” That was his maxim throughout his career on the Council and he succeded. For many years he was chairman of the Housing Committee and the Town Planning Committee, and he brought to that work all his practical and sound knowledge, which was greatly prized by his colleagues. He regularly attended the regional planning committees at Liskeard and Camelford and the interest which he took in this work found expression in the reports he submitted to the Council. He was regarded as a man of wise judgement who was not afraid to speak his mind in the Council Chamber, and what he had to say was given with attentive consideration. In politics he was a prominent Conservative and gave much time and labour for the cause. Besides occupying the presidency of Launceston Conservative Club he actively supported meetings in the Division. He took an active part in A.R.P. Work, and was also the captain of the Light Rescue Squad during the early days of the Second World War. He had been an esteemed member of St. Mary’s church and had served on the Parochial Church Council as well as having been elected to other offices. For many years he was a member of Launceston Brotherhood, at one time being vice-president, and he also took a great interest in the W.E.A. Movement. As a prominent tradesman in the district it was natural that he was an active member of the Chamber of Trade who honoured him as their president. After spending several weeks with an illness he passed away in May 1940 aged just 60. He left a widow, Minnie, one son, Mr. E. Medland and two daughters, Mrs. A. Lyons and Mrs. F. P. Walter. The funeral was attended, in state, by the Mayor and Corporation. A service was held at Carboth, prior to the interment at Launceston Cemetery. The Vicar of St. Mary’s (Canon W. H. Rigg, D .D.) Officiated.